Readers theatre with a graphic twist! That’s the best way to describe J. Torres’ interactive presentation. After opening with a reading of one his short comic book stories (with the panels projected as a slideshow for the audience to see the art), the author will talk about how comic books and graphic novels inspired him to read and write as a child, and eventually become a professional writer. He will then show how comic scripts are written, and how stories go from script to art to printed book, while involving the audience in a fun “pop quiz” along the way. Finally, he will read a second story, but this time with the help of volunteers from the audience! A handful of students will be cast as characters in the story while the rest of the group provides the sound effects (DING! HONK! BOOM!). J. Torres offers a personal story that has inspired students; an engaging presentation with some educational content in the middle; and a kid-tested, teacher and librarian-approved “readers theatre with a graphic twist”! Torres was four years old when his family immigrated to Canada from the Philippines. At an early age, he learned to read from newspaper strips and comic books. By the third grade, he was writing and drawing comic strips for the school paper; and in the sixth grade he wrote and directed a play based on an Archie comic. By the time he graduated high school, he knew he wanted to be a writer and aspired to work for the publishers of his favourite superhero comics. That dream came true in the early 2000s when he wrote some X-Men stories for Marvel and was then hired to write the Teen Titans Go series for DC Comics. 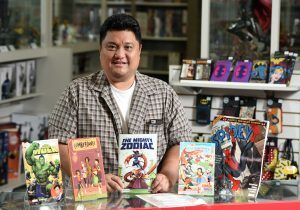 He’s been writing comics and graphic novels professionally ever since. Torres has written for all the major North American comic book publishers as well as some of Canada’s biggest children’s book publishers. He’s written stories for popular characters and titles such as Avatar: The Last Airbender, Batman, Black Panther, Degrassi, Ninja Scroll, Rick and Morty, The Simpsons, Wall-E, Wonder Woman, Yo Gabba Gabba, and many others. His graphic novels for younger readers include Bigfoot Boy, Brobots, The Mighty Zodiac, How to Spot a Sasquatch, and the forthcoming Hockey Night in Galaxia.